He was a ferocious fanatic, whose object was to destroy all the improvements of modern times, and force society back to the government, customs, and ideas of mediaeval days. In his insensate rage against progress he stopped vaccination; consequently, small-pox devastated the Roman provinces during his reign, along with many other curses which his brutal ignorance brought upon the inhabitants of those beautiful and fertile regions. 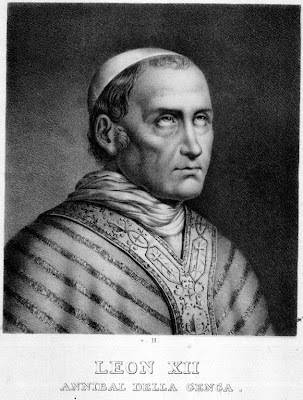 Annibale della Genga - a sickly 63 year old crippled by chronic haemorrhoids - was elected Pope Leo XII in 1823 and began a stronger, more religious and more conservative regime in the Papal states. As a consequence, he became a much derided figure. The authority of the popes had been much weakened during the enlightenment, the subsequent revolution and the violence which followed. Leo’s appointment by the Zelanti came in reaction to this and to the constant manipulation of papal policy by political prudence. He was pious, puritanical and confrontational; with a habit for shooting birds in the Vatican gardens which shocked the cardinals. In the internal government of the Papal states he took steps to establish his moral authority. Gaol sentences were introduced for people caught playing games on Sundays and feast days, tight fitting dresses were forbidden for women. Encores and ovations in theatres were forbidden and actors and actresses ad libbing lines on current affairs were forbidden. The bars in Rome were forbidden from selling alcohol which had to be bought in the street from grills; this led to a massive increase in public drunkenness. The Jews were ordered back into ghettos and forbidden to own real estate. 300 of them were required to attend Christian services every week and business transactions between Jews and Christians were forbidden. The subsequent exodus of Jews from the Papal States worsened an already fraught economic situation. Leo’s assistants were no better. Cardinal Ravorolla who was sent as legate to Ravenna became a figure of fun for his tyrannical decrees. He closed inns, banned gambling and required anyone who went out at night to carry a lantern with them. He also installed a great iron bound chest outside his residence into which people could put anonymous denunciations of their neighbors, Cardinal Palotta attempted to deal with the huge numbers of brigands in his provinces, but became so hated he was forced to resign. When he did so the brigands held thanksgiving masses to celebrate. Later the practices of inoculation and vaccination faced fierce theological opposition. Indeed in 1829 Pope Leo XII declared that whoever decided to be vaccinated was no longer a child of God; smallpox was a judgement of God, vaccination was a challenge to heaven. ‘He forbid vaccination against smallpox during an epidemic, stating that it was 'against the natural law'. Other sites go on to mention that thousands died during outbreaks of smallpox, all as a result of the Pope’s obstinacy and theological lunacy. This story, in its various forms has gone on to become frequently cited in the science religion debate as an example of how Christianity has blocked scientific and medical advance. 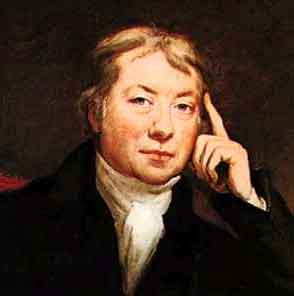 In 1796 Edward Jenner famously created a method of vaccination which could prevent the spread of smallpox. The disease was greatly feared at the time as one in three of those who contracted smallpox died, and those who survived were often badly disfigured. Jenner discovered that by grafting a little pus produced by a benign disease of cows called cow pox he could successfully inoculate a young boy called James Phipps against the virus. Jenner's process would soon replace the inoculation by variola variolisation where a small amount of live smallpox virus was administered to the patient; this carried the serious risk that the patient would be killed or seriously ill. As Jenner’s discovery was published, the practice of vaccination began to spread gradually through Europe. The Napoleonic wars actually helped the introduction of vaccination to the Mediterranean region. Two eccentric doctors, Joseph Marshall and John Walker were sent to Gibraltar, Minorca and Malta to assist Britain’s army and navy and to inoculate the inhabitants of allied cities. Marshall ended up in Palermo where 8,000 had recently died from a smallpox outbreak. He decided to set up a vaccination centre in a Jesuit seminary where he treated the poor twice a week. From Palermo, the vaccine was brought to Naples by Michele Troja, physician of the royal family, then to Rome where he was administered in the summer of 1801. Marshall followed in the period of peace from 1802-3, setting up an institute in Naples and travelling through Rome, Genoa and Turin, spreading the benefits of Jennerian Vaccination. It was badly needed, Marshall noting for example that in the slums around Genoa, beggars would parade their pustule covered infants in a bit for charity. Meanwhile in the north, vaccination had arrived in Lombardy, brought by doctors accompanying the march of French armies. Luigi Sacco was appointed director of vaccination for Napoleon’s Cisalpine Republic in 1801 and was able to boast that within 3 years he had eliminated smallpox completely. ‘I flatter myself’, he wrote, ‘that in Italy, I have been the means of promoting vaccination in a degree which no other kingdom of the same population has equalled’. The response of the Papacy to the arrival of vaccination in Italy has been documented in Pratique de la vaccination antivariolique dans les provinces de l’État pontifical au 19ème siècle, an article written by Yves-Marie Bercé and Jean-Claude Otteni for Revue d’Histoire Ecclésiastique. When smallpox struck Rome, vaccination was endorsed by Pope Pius VII. At the hospital of the Holy Spirit in the Borgo Santo Spirito between the shore of the Tiber and the Vatican, the papal authority established a vaccination centre which received 800 newborns each year. This was operated by doctors like Dr. Alessandra, who had previously been an ardent propagator of smallpox inoculation, Domenico Moricchini the Neapolitan chemist (1773-1836) and the young Alessandro Flajani. 'Almost all the new born children are vaccinated’ Sacco reported to Baron in 1824 ‘so that we now know no fear of the smallpox’. The approval of vaccination in Rome is demonstrated by a work by Alessandro Flajani in 1805 which documented his investigation into the medical policies in progress in Berlin, Vienna, London and Paris’; a large part of this work concerned the practice of vaccination. The report was published on his return to Rome. According to the rules of censure, the book was judged conform to the Catholic religion, the faith and manners; it received on June 16, 1807 the approvals of P. Oliveri, Dominican, professor in Archiginnasio of Rome, the professor of medicine Francisco Petraglia and the administration of the ecclesiastic state . The book was then dedicated to the Pope. It is therefore certain that in the beginnings of its circulation in Europe vaccination was officially allowed by the Church in moral theology and that it was practised publicly in the large Roman hospital. Ample precedent for this had already been set by Pope Benedetto XIV (Pope Lambertini) who had tried to introduce smallpox inoculation by the old variolation method into the Papal States in the early eighteenth century. Did things change later on?. Apparently not. According to Bercé and Otteni, in January 1814, the French evacuated central Italy, to be replaced by the troops of Murat, king of Naples. In the provinces of the North of the State of the Church, Emilie and Romagna, it was the Austrian army which assumed the leading role. Pope Pius VII returned to Rome on May 24 1814 and in May 1815, the pontifical administration recovered its territories to the North. All the measures of the previous leadership were retained and the only changes were titular, which became pontifical rather than imperial. The use of French was removed from public documents, but most notable dignitaries, magistrates, administrative officers were unchanged, with very little prosecution of the beneficiaries of the previous regime. Vaccination initiatives, which had become fewer because of the military events in 1813 and 1814, began again to operate fully at the end of 1815. The authorities of the various Italian States were attentive to the dangers of epidemics. The arrival of the cholera in Rome in 1830 occasioned emergency measures and the reinforcement of the medical commissions. It does not seem that there were any unusual levels of mortality in Rome during the 1820s and 1830s, nor beyond that. An investigation by a French doctor, Hippolyte Combes in 1838, gave very favourable judgements of the Italian medical policies in general. According to its account, the ecclesiastical State was not an exception and had maintained a rate of medicalisation comparable with the remainder of the peninsula. It also singles Leo XII out for praise for subsidising medical education in Rome. The Italian medical press does not make any mention of any ban on vaccination or any unusual rate of death in the ecclesiastical states; nor do the doctor’s professional bodies - although often resolutely critical towards the temporal authority of the pope - criticize the the papacy for being negligent in its medical affairs. In short, no record of a ban or any suggestion of a ban by Leo XII and his administration can be found in the archives. ‘After Consalvi, vaccination continued under Leon XII, who does not seem to have required it to stop, as opposed to what a certain tradition claims’. Research of the interdict in treaties of ecclesiastical history has also failed to turn up anything. A Catholic historian Donald Keefe came across the story when it was repeated by Prof. Daniel Maguire of Marquette University. Keefe tried to trace the source of the quote from Leo XII, tracing it from footnote to footnote, from book to book and found it had emanated from a Dr. Pierre Simon in Le Contredes naissances with no authority given at all. It is probable however, that the myth is much older and dates from the 19th century as it can be found in G. S. Godkin’s ‘Life of Victor Emmanuel II’ from 1880. 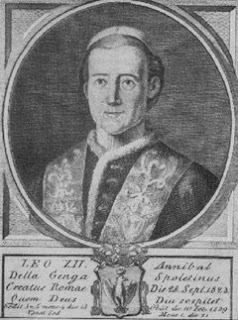 According to Bercé and Otteni the origin of the mythical vaccination ban of Leo XII is undoubtedly due to the personality of Cardinal Della Genga when he become pope in 1823. His intransigence and piety alienated liberal opinion very quickly. His austere spirituality made him the target of criticisms and mocking remarks. English travelers visiting the peninsula and many of the diplomats established in Rome remarked on the severity of the pontiff. 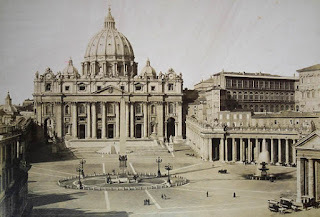 The obscurantism of the Church, the inertia of the pontifical government, the ridiculous superstitions of Italian piety, the idleness and the dirtiness of the Southerners were commonplaces stereotypes from the accounts of travelers to Italy. These rumors would have reached the ears of whig historians such as G. S. Godkin and percolated into their historical narratives. In conclusion, Leo XII’s alleged ban of vaccination is a whiggish myth which has been repeated and promulgated slavishly ever since, despite having absolutely no basis in fact whatsoever. No doubt in cyberspace it will continue to take on a new lease of life amongst those who will swallow any myth as long as it is anti-catholic or anti-religious. Thanks to Alfonso Taboada for bringing this to my attention.